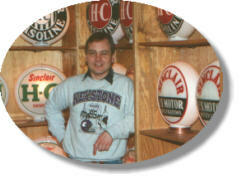 Scott Benjamin began collecting petroleum items in 1975 with the purchase of a single visible gas pump and Texaco globe. Since that time he has owned thousands of gas pump globes and currently is the largest dealer in original gas pump globes in the world, operating under the name "Oil Company Collectibles". Scott serves as General Manager for Petroleum Collectibles Monthly and handles all of the advertising and sales operations. Scott has teamed up with PCM partner Wayne Henderson to write fifteen books about petroleum collectibles including the 1993 Gas Pump Globes (now out of print) and the newer, Gas Pump Globes ebook. Visit the PCM Bookstore. Many of the globes we sell never make it on our print ads or this Web site. Let us know what you are looking for and we will add you to our extensive wants list. We do appraisals for insurance and peace of mind. They can be done by photos sent by email or descriptions on the phone. See our Appraisals page. Consider a subscription to PCM magazine and browse through the books we offer about petroleum collectibles.